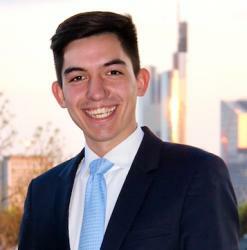 Marco is a BSc in Banking & Finance student at Frankfurt School and leading the student initiative and Investment Club „FS Invest“. As an internationally orientated university, we truly believe that banking goes beyond borders. For the very first time, the Investment Club of Frankfurt School organized an Investment Banking Trip to London to give 12 selected students the opportunity to visit Europe’s financial capital and obtain valuable insights into Investment Banking Divisions of the world’s most prestigious financial institutions. The idea of establishing an annual Investment Banking emerged by looking at our competitors. Almost every finance society or investment club at Europe’s renown universities (Bocconi, HSG, HEC Paris, IE Madrid) had established their own version of the London Banking Trip. After researching and connecting to our fellow students from the different investment clubs, they not only gave us insights into the inner workings of their banking trips, but also endorsed our idea of establishing an annual banking trip at Frankfurt School. The following week we worked hard on creating a solid concept on how the trip should look like and then pitched our idea to the university as well as to the student council, from whom we also received full support. We were then set to go and could start to look for companies and participants. We thought that scheduling an event with a bank was a thing of roughly 2 weeks. Write an Email to HR, get positive feedback, schedule a date (maybe two more mails) and we were set to go. However, this thought was far away from reality. Getting firms to schedule an event with our investment club was not as easy as it sounds since all major financial institutions already have a fixed schedule with their target universities. These target universities were some of the world’s most renown schools such as Oxford, Cambridge, LSE, LBS, etc. As we realized that we were competing with these top-notch schools, we found ourselves approaching lots of companies not only through the Human Resources Department, but also through FS Alumni who have made their way to London. Latter was the way to go. Over time, lots of Frankfurt School Alumni have settled in the city to work in Investment Banking, Consulting or PE/VC. With the help of Career Services, we reached out to many alumni and most of them were happy to arrange an event with us! Our final schedule included Berenberg, Commerzbank, Deutsche Bank, FOM Capital, RWE Supply & Trading, SMBC Nikko and Société Générale. With such an international spectrum of companies, we quickly found 12 high-performing and banking-interested participants from all intakes which were up for the challenge. Before flying to London, the group was split up to prepare presentations about the daily business of the firms and the different areas in Investment Banking. Through these informative presentations all participants could broaden their financial horizon and prepare themselves in the best way possible to leave a solid impression of Frankfurt School in London. We arrived in London on a sunny Tuesday morning and had the whole day to explore the vibrant city before starting the program on Wednesday. Commerzbank was our first office visit and they not only showed us the theory by introducing us into their Sales & Trading business, but also showed us real-life trades on a guided tour through the trading floor. To strengthen the team spirit, we decided to grab some fine lunch at Burger & Lobster which was followed by our second office visit at Berenberg, who gave us deep insights into the process of a M&A deal with real-life examples. The following two days were thrilling and challenging, with M&A and DCM case studies at Société Générale, a discussion panel with analysts, associates and managing directors at Deutsche Bank, a look into the investment process of a venture capital firm, a talk with executives of SMBC Nikko and a visit of the trading floor at RWE. We also received the opportunity to attend an Alumni event where we saw familiar faces again, but also got to know many other interesting and high-performing personalities. After being in London for 4 days, there was a lot that we took home from this unique experience. Besides experiencing London as a city and learning more about Investment Banking, we met new people from our own university and connected to the speakers we met at the different companies. All companies offered fast-track applications for internships and 7 of our participants even got invited to an interview with the M&A Division of Société Générale. Looking back we can say that the London Banking Trip 2018 was worth the trip and will definitely be repeated in 2019 – stay tuned! Big Thanks to the Career Services for their throughout support and to the marketing department of Frankfurt School! Written by Marco Winter and Lukas Wadle. Lukas Wadle is a last-year BSc Student at Frankfurt School and will start his Master of Finance in ’19.